Coloring your concrete driveway makes it more visible and appealing. There are different ways in which a concrete driveway can be painted. Each technique has its own merits and also demerits. You need to have an understanding of the various methods before settling on any of them. Some of the methods are discussed in this article. This driveway coloring technique applies to new pours. The color of your choice is put into the concrete mix before pouring the combination on your driveway. The combination will be precise and go all through making the color spread even. The color in this concrete mixture can’t be chipped or worn away. Weather conditions also can not lead to fading of the concrete, ask your local concrete contractor. However, the colors for this kind of technique are only limited to earth tones. You can use grey, brown, tan or subtle red. This technique may not be the best choice if you are looking for eye-catching colors. Some contractors prefer using integral coloring as the base color. After integral coloring, they use dyes or color hardeners for finishing. This would give an attractive color hue. Concrete dying produces vibrant colors when compared to other methods. You can use a variety of bright colors like red, yellow, purple orange and blue. Dying offers a brilliant finish if it’s done well and the color is not too bright. The technique is appropriate for labeling or creating detailed information. Dying is prone to environmental conditions. If exposed to sunlight for some time, the bright coloring would fade away. This makes its use for outdoor activities to be limited. If need be, you can use a sealer which could make it stable and less prone to environmental conditions. Color staining technique is one of the most common in the construction industry. 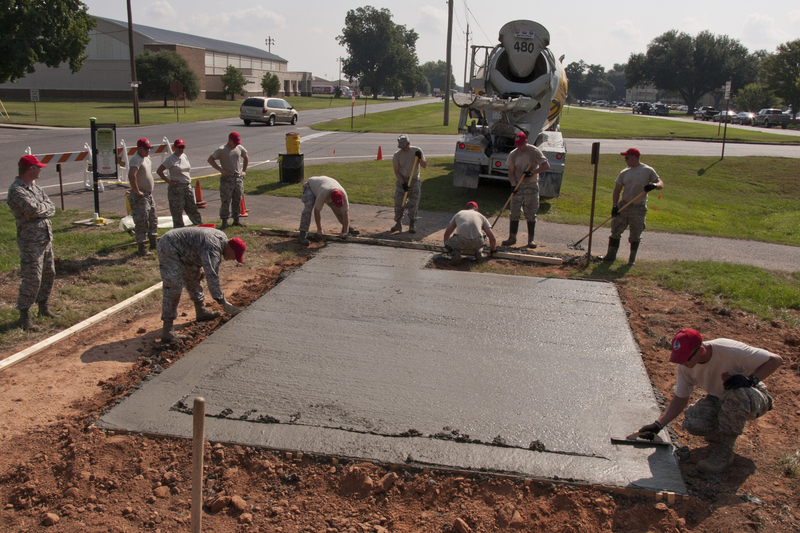 Its popularity is attributed to its extensive use on both new and used concrete pathways. If you are looking for correct earth-tone color, this would be a good choice. It will blend well with the surroundings and homeowners like the beautiful tone it produces. Concrete staining can be done using colors like brown, tan and terra cotta. The technique ensures the colors penetrate the concrete surface. This produces a permanent pigment which is UV stable. If you need a dye that would serve you for years, this would be a perfect choice. A homeowner can use this technique to paint their driveway because it hardly fades. This technique is useful if your driveway is made from stamped concrete. The color hardener offers extra strength and color intensity to the concrete surface. Concrete pathways colored with this technique are less prone to wear. They are also resistant to moisture and de-icing agents compared to other methods. However, the application process of the color is messy hence making different contractors avoid it. It would give them an extra duty of cleaning the surfaces after the process of coloring. The dry powder can be easily blown before its mixed to form the paste. It might also damage nearby structures. If a worker is exposed to such working conditions for long, they may suffer from breathing problems. Coloring your driveway would make it look better and make it visible. After reading through this article, you will be able to tell which technique would be the best for your driveway. Consider working with a professional contractor for a quality job.